Donald Waltman was born on December 17, 1930, in Kellogg, Idaho. He attended the University of Idaho, and entered the Idaho Air National Guard on August 2, 1954, receiving his commission as a 2d Lt through the Air Force ROTC program on March 14, 1955. Lt Waltman remained in the Idaho ANG on active duty as an Adjutant until going on active duty in the U.S. Air Force on August 29, 1955. He served as an Adjutant with the 84th Material Squadron at Geiger Field, Washington, from August 1955 to May 1957, followed by pilot training from May 1957 until he was awarded his pilot wings at Laredo AFB, Texas, in June 1958. Lt Waltman attended All-Weather Interceptor training at Moody AFB, Georgia, from June to November 1958, and then Advanced Survival School at Stead AFB, Nevada, from November to December 1958. His next assignment was as an F-86D Sabre pilot with the 324th Fighter Interceptor Squadron at Sidi Slimane AB, Morocco, from January 1959 to March 1960, and then with the 7221st Air Base Squadron at Sidi Slimane from March to April 1960. Capt Waltman served as an F-102 Delta Dagger pilot with the 525th Fighter Interceptor Squadron at Bitburg AB, West Germany, from April 1960 to July 1962, followed by service as an F-102 pilot with the 460th Fighter Interceptor Squadron at Portland International Airport, Oregon, from July 1962 to March 1966. His next assignment was with the 4625th Support Squadron at Portland International Airport from March to September 1966, and during this time he completed F-105 Thunderchief Combat Crew Training. Capt Waltman deployed to Southeast Asia in September 1966, and served as an F-105 pilot with the 13th Tactical Fighter Squadron at Korat Royal Thai AFB, Thailand, from September 7, 1966, until he was forced to eject over North Vietnam and was taken as a Prisoner of War on September 19, 1966. After spending 2,359 days in captivity, Lt Col Waltman was released during Operation Homecoming on March 4, 1973. He was briefly hospitalized to recover from his injuries at Travis AFB, California, and then attended Air War College at Maxwell AFB, Alabama, from August 1973 to June 1974. 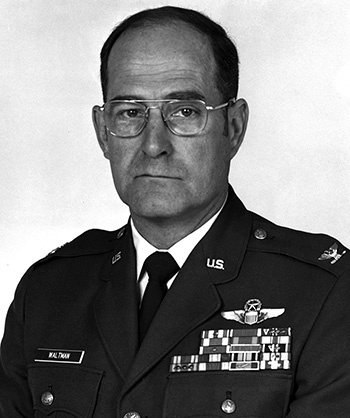 He attended F-111 Aardvark Combat Crew Training at Nellis AFB, Nevada, from June 1974 to February 1975, followed by service as Chief of the Operations Plans Division with the 474th Tactical Fighter Wing at Nellis from February to June 1975. His next assignment was as Commander of the 428th Tactical Fighter Squadron at Nellis AFB from June 1975 to March 1976, and then as Assistant Deputy Commander for Operations of the 474th Tactical Fighter Wing at Nellis from March 1976 to January 1977. Col Waltman served as Assistant Deputy Commander for Operations of the 20th Tactical Fighter Wing at RAF Upper Heyford, England, from January 1977 to May 1979, followed by service as Deputy Commander of the 406th Tactical Fighter Wing at Zaragoza AB, Spain, from May 1979 to May 1980. His next assignment was as Deputy Commander and then Commander of the 20th Tactical Fighter Wing at RAF Upper Heyford from May 1980 to May 1981, and then as Chief of the European Officer Exchange Program in London, England, from July 1981 until his retirement from the Air Force on May 1, 1985. Donald Waltman died on September 5, 1997, and was buried at Arlington National Cemetery. Captain Donald G. Waltman distinguished himself by gallantry in connection with military operations against an opposing armed force over North Vietnam on 19 September 1966. On that date, Captain Waltman was the pilot of an F-105 that struck and destroyed a heavily defended target deep in hostile territory. Despite the intense and accurate anti-aircraft fire, Captain Waltman pressed the attack and delivered his ordnance squarely on target rendering it unusable. He demonstrated heroism of the highest order and distinctive professional airmanship as he directed his aircraft against his target. By his gallantry and devotion to duty, Captain Waltman has reflected great credit upon himself and the United States Air Force.